Together, we helped force one of the world’s most powerful oil companies to leave the Arctic and moved the Obama administration to close the door to Arctic oil drilling for the next two years. 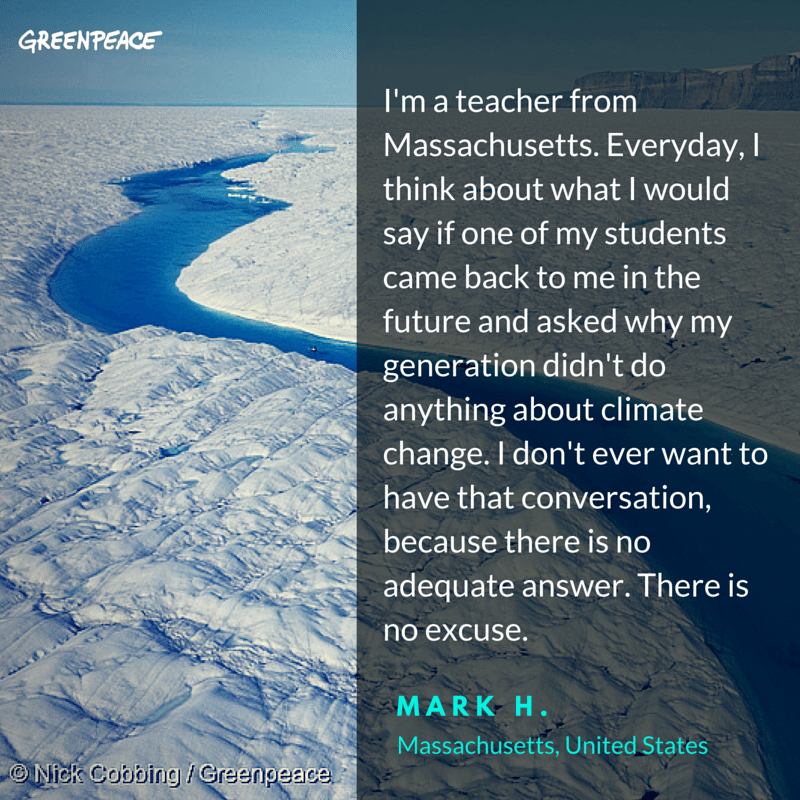 Shell had billions of dollars and an army of lawyers, but we had millions of passionate people prepared to do whatever it takes to protect our planet. Together, we won. Every voice mattered. Each action worked. This incredible victory is a sign of hope. While there’s still more to do to ensure permanent protection for the Arctic, here’s a look back on what’s become one of the most inspiring and powerful movements for environmental justice in recent history. 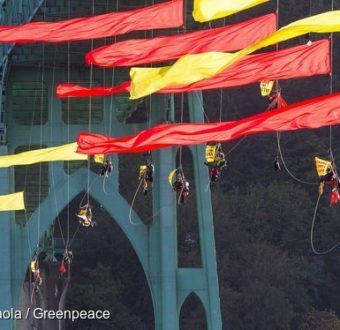 In August 2015, activists rappelled off St. John’s Bridge in Portland, Oregon in the middle of the night to create an aerial blockade preventing an icebreaker essential to Shell’s drilling operations from reaching the Arctic. 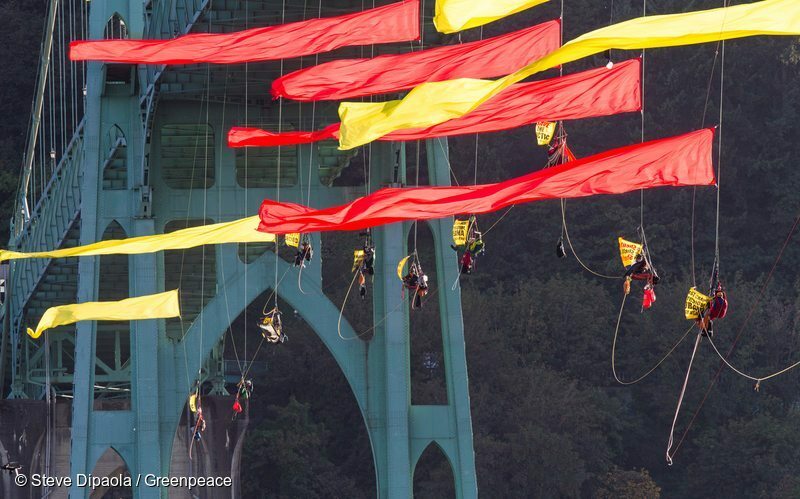 Harmony Lambert hangs under the St. Johns Bridge in Portland, Oregon to block Shell’s icebreaker, the MSV Fennica. Photo by Tim Aubry / Greenpeace. The climbers hung from the bridge for two days and were joined by local kayaktivists who took to the water to help prevent the vessel from passing. The icebreaker came to Portland to have a gash in its hull repaired. The whole world was watching Portland for those 40 hours, making for one of the most inspiring and picturesque moments in activism in recent history. In April, six brave individuals intercepted Shell’s gigantic Arctic oil drilling rig, the Polar Pioneer. The six Greenpeace climbers boarded the Arctic-bound rig in the middle of the Pacific Ocean, 750 miles northwest of Hawaii, and scaled a 38,000-ton platform for the action. They remained for six days, drawing attention and support from around the world. 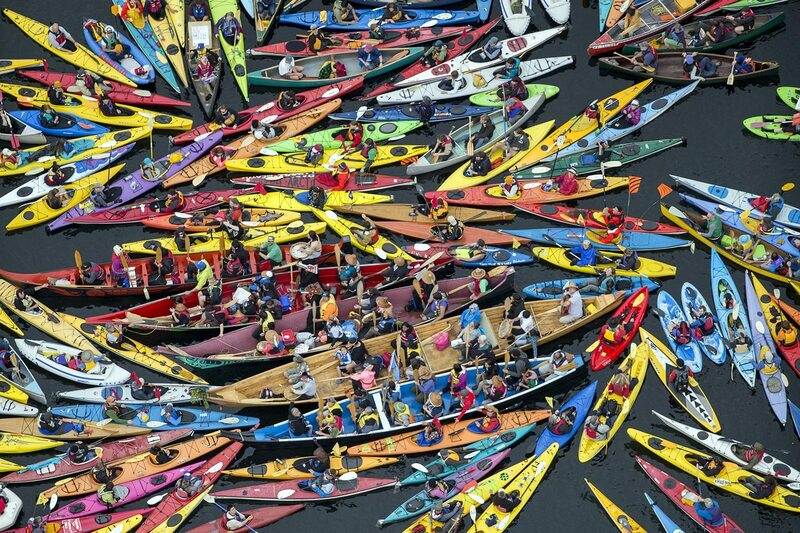 And then in May, Seattle made history when hundreds of community members organized and joined the Paddle in Seattle. 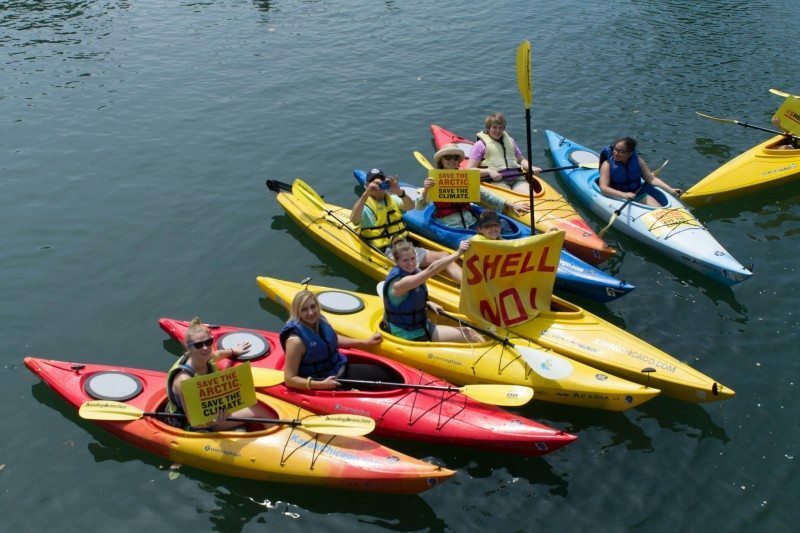 Activists swarmed the Puget Sound in kayaks and boats to surround Shell’s drilling rig that was stationed in Seattle on its way north to join oil drilling operations in the Arctic. 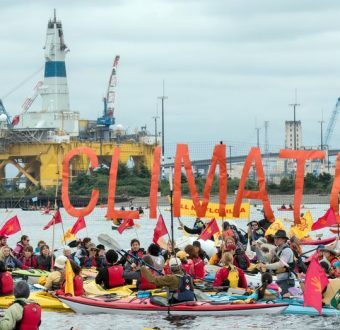 Kayaks became an international symbol of the fight against oil drilling in the Arctic, with the term ‘kayaktivist’ catching on to describe the floating protesters. And on June 15, many of these same kayaktivists put themselves directly in between the Polar Pioneer and the Arctic in a floating blockade as the rig left Seattle. 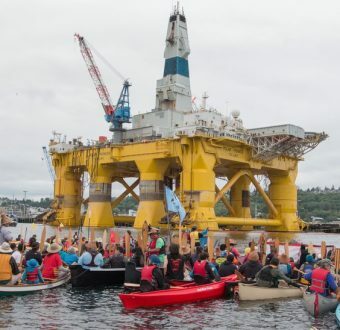 Kayaktivists and canoe families took to the water as Shell’s Polar Pioneer arrived in Seattle. Photo by N. Scott Trimble / Greenpeace. Also in June, Native American women in the Washington state area organized a rally in Seattle and land and in traditional canoes in a strong and beautiful showing of solidarity for native communities in the Alaskan Arctic that have been fighting Shell’s oil drilling plans for years. The floating rally was a huge success, with native peoples coming from across the region to participate in prayer, traditional music, and demonstrate firm opposition to Shell’s use of Seattle’s port to prepare for their hunt for Arctic oil. Sweetwater Nannauck of Idle No More Washington. Photo by Mark Meyer / Greenpeace. 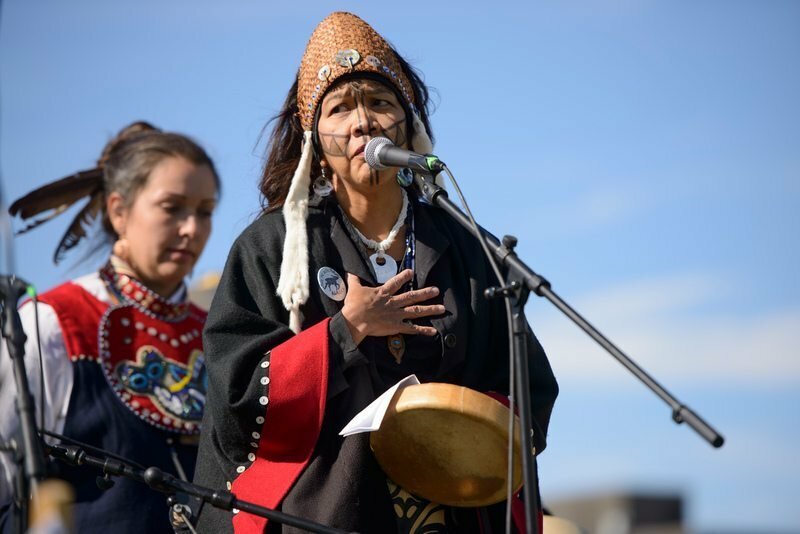 And in the same month, First Nations artist and activist Audrey Siegl stood on a small boat, bravely confronting Shell’s 300-foot-tall Arctic drilling platform in Canadian waters off the coast of British Columbia on its way to the Alaskan Arctic. Protesters flooded port commission hearings throughout 2015 to show unyielding opposition to Shell using the city’s port terminal to prepare for its Arctic drilling operation. Even the mayor of Seattle came out against Shell using the port terminal, citing that the terminal that Shell had leased isn’t licensed for oil rigs, but rather cargo only. 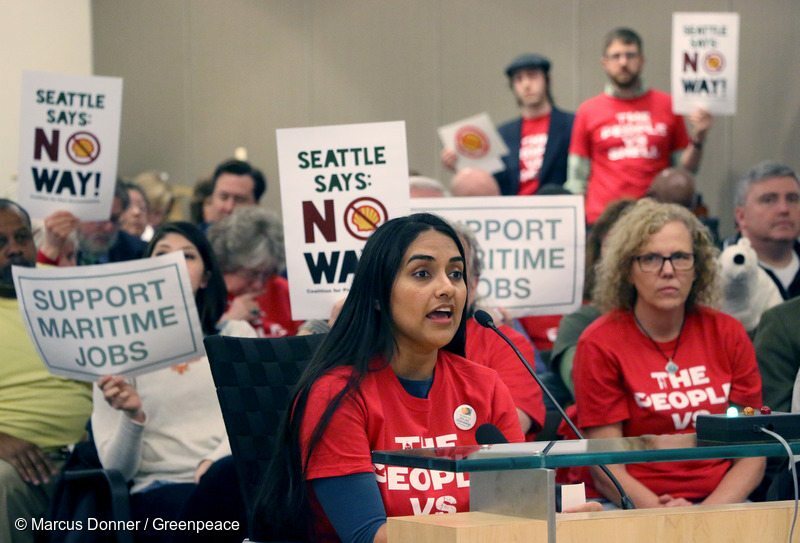 Zarna Joshi speaks against a lease agreement to house Shell’s Arctic drilling fleet in Seattle during public testimony at the Port of Seattle Commission hearing. 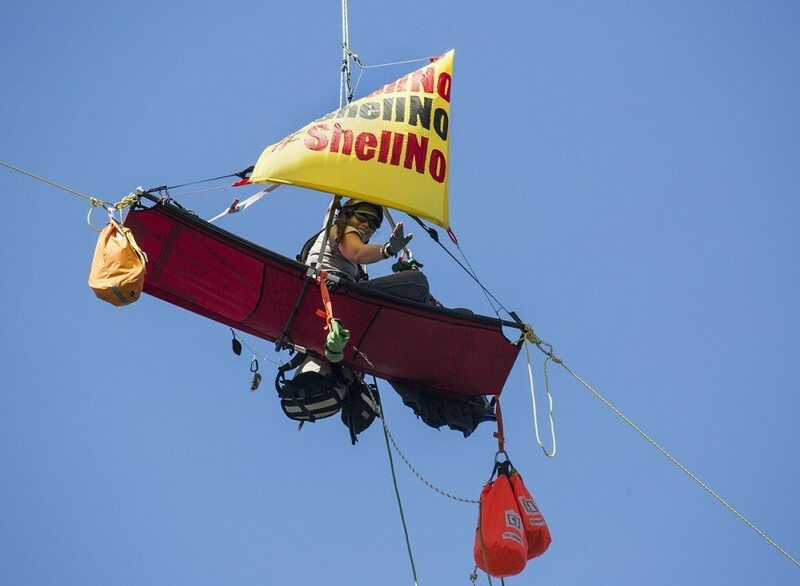 In meetings that happened throughout the spring, Seattleites stayed for hours, voicing concern that their city was being used as a landing pad for Shell’s dangerous and potentially tragic hunt for oil in the Arctic. When President Obama went to Alaska to talk about climate change, he was greeted by hundreds of Alaskans in Anchorage protesting his approval of Shell’s plans to drill for oil in the Alaskan Arctic, one of the most dangerous and costliest drilling expeditions in the history of fossil fuel extraction. Representatives from organizations around the state spoke, including the Alaska NAACP, RedOil, Interfaith Climate Action Group, BAYAN Alliance, Unite Here Local 878, and Idle No More. 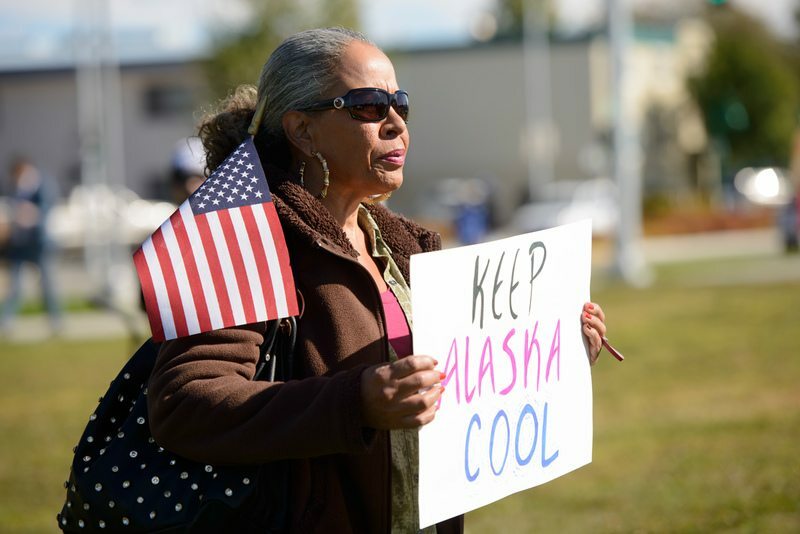 Janette Camacho of Anchorage holds a sign reading “Keep Alaska Cool” as allied groups opposed to Shell’s Arctic drilling held a “Rally to Confront the Glacial Pace of Political Action” as President Obama meets with ministers from around the world for the “GLACIER” conference at the nearby Dena’ina Civic and Convention Center. In July 2015, residents of Unalaska gathered to protest Shell’s plans for Arctic drilling as well as the presence of its drilling fleet in local waters vital for commercial and subsistence fishing. As Shell’s vessels occupy the bay, they serve as a stark reminder of Shell’s past blunders in Unalaska, where the Noble Discoverer rig ran around in 2012. More than 1,000 activists from the Pacific Northwest region gathered in Seattle in April to protest fossil fuel projects, including the recent deal between the Seattle Port and Shell for the company to host its Arctic drilling fleet in the city for two years. The massive demonstration was led by those most affected by our continued reliance on fossil fuels. Speakers and performers represented urban communities of color who suffer from disproportionate asthma rates, islanders displaced by rising sea levels, indigenous peoples whose homes are threatened by oil drilling, and Seattle community members who are committed to environmental justice at home and around the world. The next month, hundreds of people from Seattle gathered at the port terminal for You Shell Not Pass, a huge non-violent day of action where protesters demonstrated on the shore and in the water, disrupting Shell’s ongoing Arctic drilling preparations in Seattle. The “Seattle Draws The Line” rally to take a stand against dirty fossil fuel projects. On the global front, more than 1,000 people marched through the city center of Helsinki on July 3 this summer to protest Shell’s Arctic oil plans. Elsewhere in Helsinki’s harbor, another group with canoes, kayaks and a sailing boat protested near icebreakers that were contracted to join Shell’s Arctic drilling fleet later in the year. 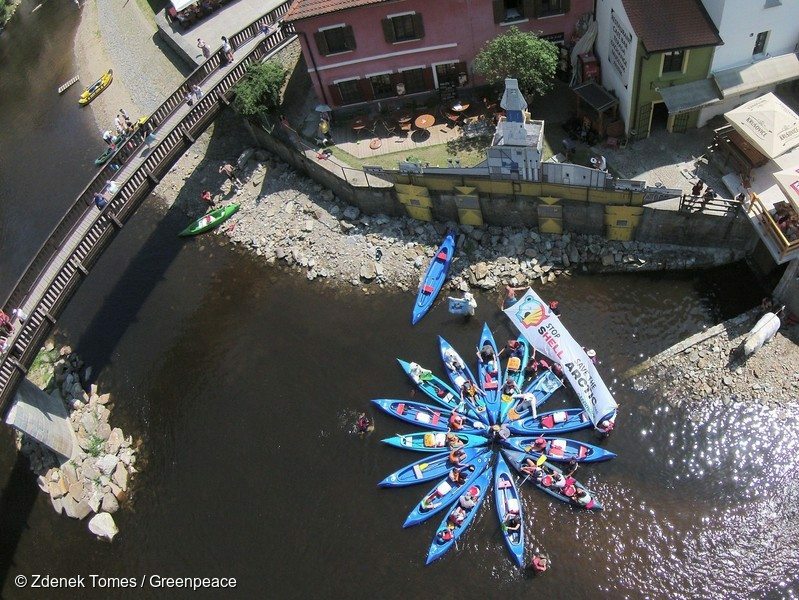 People participated in the day of action all across the world, including kayaktivists and protesters in the Czech Republic, Argentina, Finland, Denmark, Germany, Spain, Russia, Brazil, the Netherlands, Sweden, Turkey, and Norway. Kayaktivists from six European countries join a global movement to protect the Arctic from oil drilling. Everyone who signed a petition, shared the news with their community, posted photos, and helped to spread the word — the pressure Shell felt to abandon its Arctic oil operations is in large thanks to you. 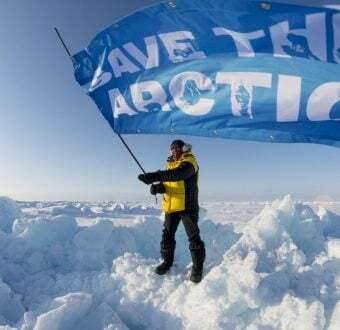 Around the world, more than 7 million people have signed petitions to save the Arctic to demand President Obama and other world leaders take swift action to protect one of the most vitally important ecosystems on Earth. A letter sent to President Obama asking him to stop Shell’s Arctic drilling plans. Together, we shared the news and every moment of this movement. 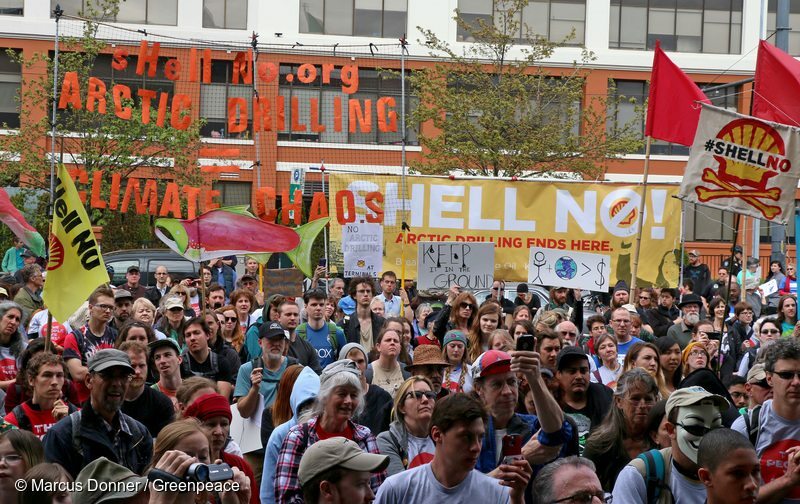 Whether you attended one of the countless actions worldwide or you followed along hoping for the tides to turn, the success of our efforts to keep Shell from drilling for Arctic oil is a victory for us all — and for future generations. More than a dozen communities across the United States rallied on land and on water to say #ShellNo to Arctic oil. From Detroit — home to the most polluted zip code in Michigan — to San Francisco, from Alaska to the White House, and a dozen other places in between, people across the country participated in the nationwide #ShellNo Day of Action this summer to send President Obama a clear message: Arctic oil drilling is not the answer to runaway climate change. Kayaktivists at a #ShellNo day of action protest in Chicago. Photo via the Sierra Club. In one day, 3,000 calls jammed the White House phone lines from individuals across the nation taking a stand against the Obama administration’s decision to allow Shell to search for Arctic oil. The volume of calls forced the White House to shut down its phone lines for the day. People opened up their homes and local spaces around the country and held parties across to write letters to the editor to help inform their communities about the dangers of Arctic drilling and why anyone concerned about the future of our planet needed to help President Obama get the message: there’s no such thing as safe Arctic drilling. Dozens of parties were hosted nationwide by grassroots activists organizing on Greenwire, Greenpeace’s online hub for organizers to connect and plan actions to protect planet. In September 2015, we saw Aurora’s Parade, when a giant people-powered polar bear the size of a double-decker bus was pulled through London. Protesters were joined by acclaimed British actor and screenwriter Emma Thompson in a protest against Shell’s drilling in the Arctic. 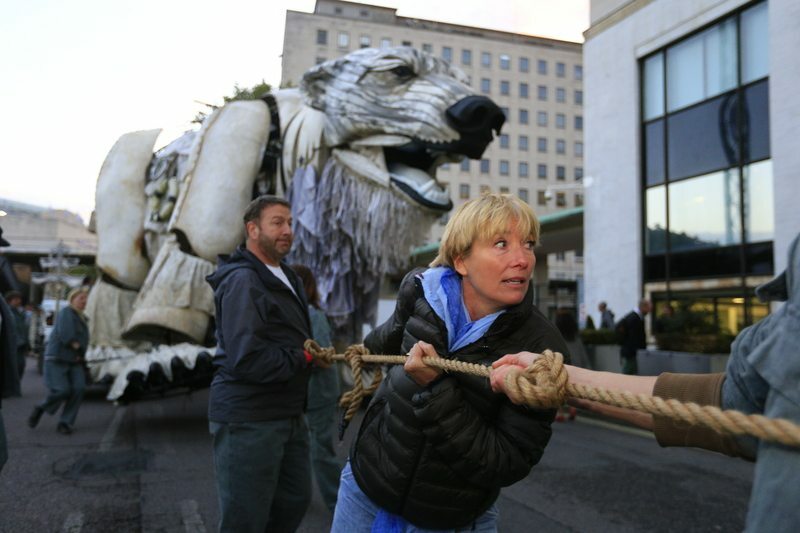 Emma Thompson pulls a colossal polar bear puppet, called Aurora, the size of a double-decker bus outside of Shell’s London headquarters. Photo by Jiri Rezac / Greenpeace. Aurora and the activists remained parked outside Shell’s global headquarters for weeks, serving as a stark reminder to the oil corporation of the seven million people who have voiced opposition to its oil drilling in the Arctic. The giant bear was filled with the names of the 7 million people who have demanded an end to Arctic drilling. The Arctic is much safer now. You did this. But the fight to rein in runaway climate change is going to be a long one. Are you in? After Shell Defeat, People Are Asking "What's Next?" Here's Their Answer. Shell announced it was cancelling its Arctic drilling plans this week citing reasons of cost, regulatory challenges and reputational damage. Now the question is what's next for Arctic drilling? Monday’s news of Shell’s decision to stop searching for oil in the Alaskan Arctic marks a milestone in the ongoing fight to rein in runaway climate change. We’ve traveled far to get here, yet the road ahead of us remains a long one.